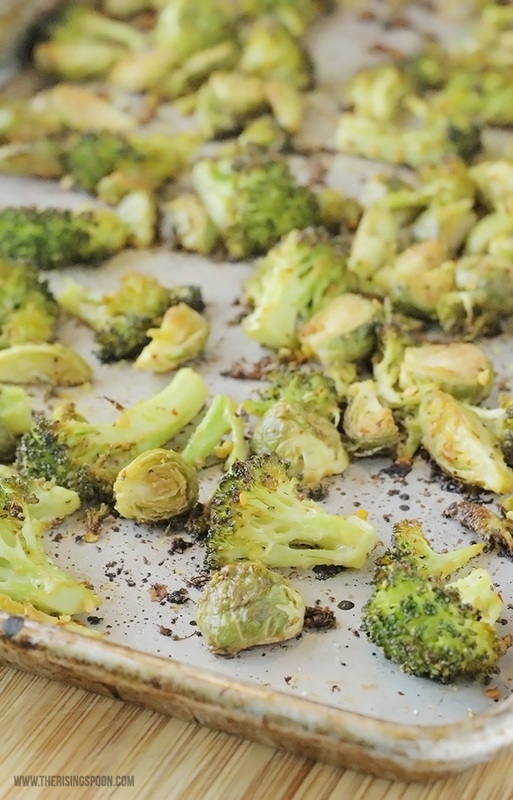 One of my favorite ways to cook cruciferous vegetables like broccoli, cauliflower, and brussels sprouts is roasting. In fact, I'm having a hard time thinking of a veggie that wouldn't taste amazing roasted. All it takes is a liberal drizzling of cooking oil, a sprinkling of your favorite seasonings, and a quick trip into the oven, which leaves the veggies fork tender with bits of the outside slightly charred. This equates to a ton of flavor...even for unpopular veggies like brussels sprouts. I know lots of folks like to pair brussels sprouts with bacon to make them more edible for picky eaters, but for situations where not everyone does meat, this seasoning combo is fantastic! The main stars are the fresh lemon juice nutritional yeast. They add a brightness and "cheesy-ness" that really compliment one another. If you don't have any nutritional yeast on hand, you can substitute parmesan cheese instead, although it'll have a slightly different flavor. Perhaps my favorite thing about this recipe (and roasting) is that it only takes about 20 minutes to cook the veggies. So, you can prep and season them in a few minutes, pop them in the oven, then work on a quick main course like pan-fried chicken breast, salmon, or even bone-in pork chops. This roasted brussels sprouts & broccoli dish is also tasty enough to serve alongside a big feast like Thanksgiving! It's also good to have more vegetable side dish options, right? 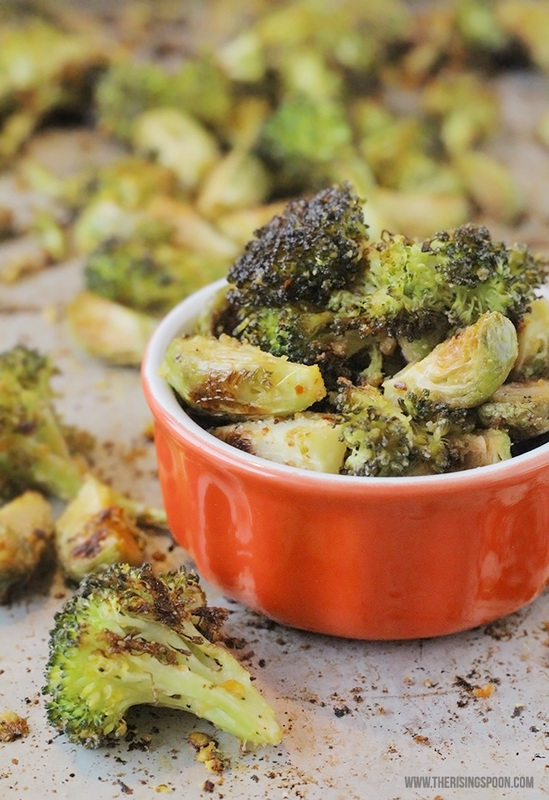 Oven-roasted brussels sprouts and broccoli with lemon juice, garlic, and nutritional yeast. This quick side dish recipe is flavorful, healthy, filling, and full of fiber and extra protein. If you don't have access to nutritional yeast, substitute parmesan cheese. Preheat oven to 400 degrees. Chop the broccoli into small florets and the brussels sprouts into halves or quarters, discarding the woody ends. Smash, peel, and mince two garlic cloves. 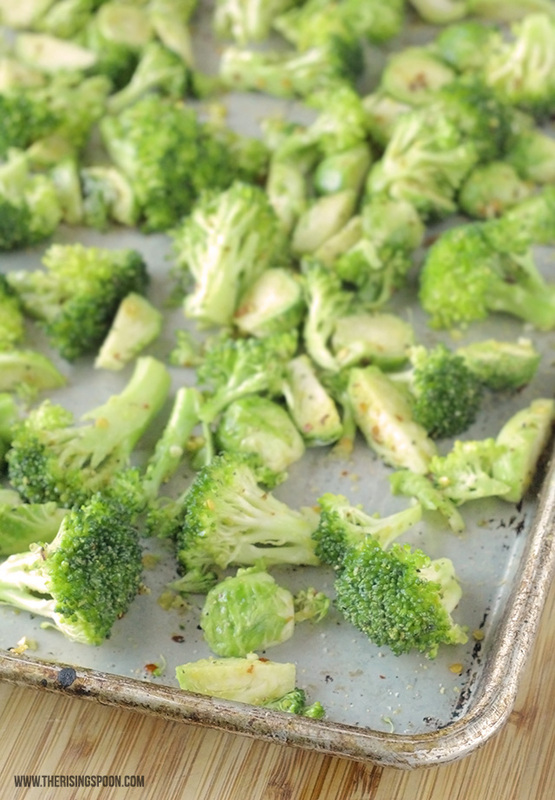 Place the broccoli and brussels sprout pieces close together in the middle of a baking sheet or roasting pan. Drizzle with cooking oil and the fresh lemon juice. Sprinkle minced garlic, garlic powder, nutritional yeast, crushed red pepper, sea salt, and black pepper onto the vegetables. Mix everything together with your hands or a spatula to incorporate the seasonings. Spread the mixture out evenly in pan, making sure there's space between the veggies. Roast for 20-25 minutes or until the veggies are tender and have crisped up a bit. Remove from the oven, top with extra nutritional yeast and lemon juice, to taste, and serve immediately. What's your favorite way to cook brussels sprouts? 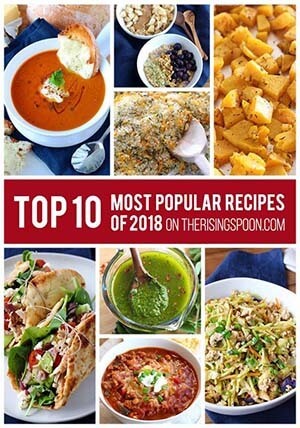 Do you have any tips for making them taste better to everyone?